On the weekends, however, the 1,235-ft. long structure sees significantly higher traffic. It is a vital conduit between U.S. Highway 10 and Interstate 94, which parallel opposite sides of the Mississippi River and connect St. Cloud to Minneapolis. Unfortunately, this 1950s-era, 30-ft. wide bridge, like so many of that time, was functionally obsolete and had a restricted maximum load of 80,000 lb. The price tag to demolish and replace the outdated Highway 24 Bridge came in at $17.4 million. From August 2015 to August 2017, two Terex lattice boom crawler cranes — the 165-U.S.-ton class HC 165 and 110-U.S.-ton class HC 110 — were tasked with completing the lion's share of the heavy lifting to construct the new, modern two-lane highway with wide shoulders and a multipurpose trail. For deck girder removal from the center and east bridge spans, a specialized piece of crane equipment not in the contractor's fleet was required. With the east causeway being short and narrow, the company needed a compact mobile crane with high capacity and long boom to help with center span lifts and one that could navigate the road embankment access the causeway. St. Cloud, Minn.-based Landwehr Construction Inc. was called in for consultation. The distance from road level to river was about only 55 ft., but “we only had about 50 ft. of room to make a 90-degree corner to position the crane on the causeway,” recalled Pat Herron, crane division manager of Landwehr. This east causeway measured only 70-ft. wide by approximately 40-ft. long. He continued, “The west causeway, where the HC 165 worked from, was approximately 450-feet wide,” which left about 145 ft. of space in between for the river to flow. The bridge's four center I-beam girders were cut to a 98-ft. length and weighed 42,900 lb. each. The plan called for a tandem lift between the HC 165 crawler crane and Landwehr's crane, which required working at a 120-ft. radius. In addition to assisting with center span removal, Landwehr was contracted to remove four east-span girders, each 137-ft. long and weighing 67,000 lb. 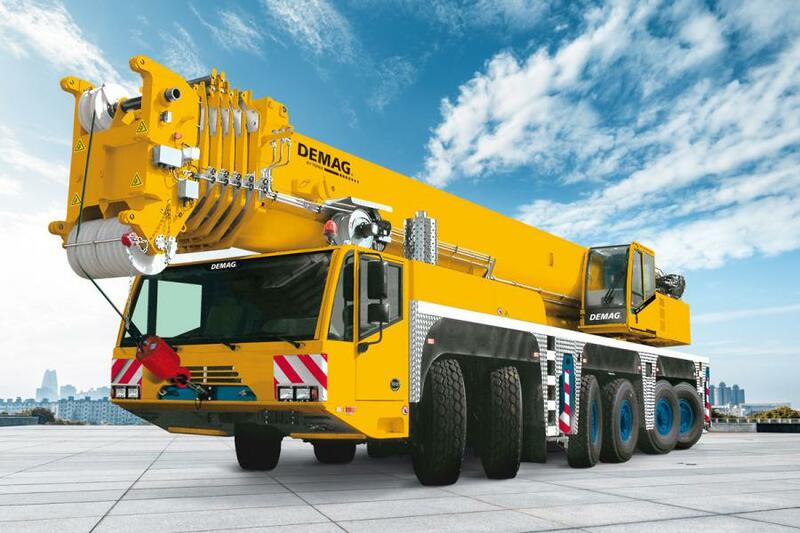 Herron knew it was going to be difficult, but there was one crane in Landwehr's fleet that offered the combination of capacity, boom length and compact design to maneuver into position and complete the lifts. “This was a job for our 400-U.S.-ton capacity class AC 350/6 all terrain crane,” said Herron, as this type of challenging project was a primary reason for Landwehr adding the AC 350/6 to its fleet. There was one catch. Girder weights and boom working radius required the AC 350/6 to be equipped with its superlift structure to meet capacity. However, causeway size didn't allow enough room for the superlift to be installed at river level. “Due to overhead obstructions and tight conditions, the crane's superlift structure had to be installed at road level with the assistance of the HC 110,” explained Herron. Landwehr mobilized the crane plus 6 truckloads of counterweight, superlift structure and miscellaneous lifting materials for the short 13-mi. trip to the jobsite. Once at the staging area, the HC 110 crane helped to install the superlift structure. Crane operator Owen Schluender carefully navigated the AC 350/6 down the embankment into operating position. “Axles 1-3 and 5-6 are steerable and the fourth axle raises to reduce turn radius, helping the crane navigate the 90-degree turn,” explained Meier. After installing 257,300 lb. of counterweight, the final superlift connections were made within a matter of minutes to complete rigging. Landwehr's experienced crew was able to complete crane set-up and positioning within 5 hours. For center girder removal, the AC 350/6 crane's boom was telescoped to 177.8 ft. Working at the 120-ft. radius offered a crane capacity of 39,900 lb., more than enough to remove the center girders in the tandem lift with the Terex HC 165 crawler crane. The following day, Landwehr's crew was back at the jobsite to remove the four east steel girder spans. Working with a 163.1-ft. boom length and a 76-ft. radius, the AC 350/6 hoisted the final 137-ft. long girders weighing 67,000-tons each in less than eight hours.